1) AKC and ASCA registration applications.These will be supplied, at time of purchase, if they are back from the registries, with cash sales, or will be mailed after checks have cleared, or any other individual conditions are met. 2) Health Warranty/Guarantee. Puppies from straight Fairoaks parents are guaranteed to be clear of hereditary eye defects. Please note that a guarantee is saying that the pupswill not have or develop a certain condition. With genetic faults controlled by polygenetic inheritance, such as Hip Dysplasia, a replacement Warrantee is given. 3) Vaccination Records:All puppies are up to date on vaccinations and have been wormed regularly. Dates for vaccinations and de-wormings are provided on your health record. 4) Information.On the care and feeding of the puppy, plus basic, handy information on health, training, behavior etc. Additional information on taking care of wormings and vaccinations, thus saving on vet bills. 5) Pedigree. Five-generation pedigree as well as generations of pictures when available. ..are born in our mudroom/office, a large room off the kitchen. From birth they are handled regularly. The Super Dog technique is practiced. They stay here until they begin to demand, usually very loudly, to be out of the whelping box and connected pen, at 2 am because they want to play. When they reach this point, they are moved to the kennel so they have more room to develop and I can keep my sanity! This can be any time from 4-6 wks. There’s more room with our indoor/outdoor runs and they can be outside in a big puppy pen for part of the day, weather permitting. I continue to bring them into the house 2-3 at a time and then just one at a time. The puppies are played with every day and are expose to our cats, horses, kids, company and lots of other dogs. I trim their nails regularly to save wear and tear on mom as well as the rest of us. They begin to learn to stand on the grooming table as we take a lot of pictures. One note here. Socialization alone does not make a stable, mentally sound puppy. 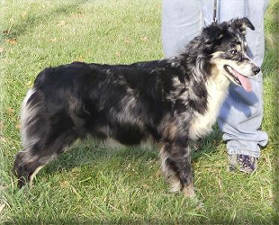 Genetics provide the temperament, intelligence, herding instinct, etc. Coupled with proper socialization the genetic material aka the puppy, is given a solid foundation, however, all the socialization in the world will not make a spooky, apprehensive little puppy, grow into a confident adult. This is where the experience of the breeder becomes extremely important. When the breeder has raised the parents, grandparents and siblings of the various relatives, they know where the traits come from and how they will develop. They have weeded out undesirable traits as best as they can, and understand how to combine various individuals to enhance the best mental qualities. Tails are docked and dew claws removed at one-two days. I’m sorry, but I will not leave tails on puppies. If you live abroad and are looking for a long-tailed pup, there are several breeders with my bloodlines, in Europe that I can recommend. Are YOU Qualified ??? Do you rate a super-duper Fairoaks puppy ??? I am strict regarding the placement of Fairoaks puppies. They are available only to those that meet my qualifications !! Sounds ominous, doesn’t it ? Keep reading ! A person does not need to feel that they can’t get an Aussie because they don’t have 24/7 to train and devote to the dog. These dogs were developed to be a helping hand, and a part of a family, NOT the center of the family and definitely not the pack leader. If you have read a lot of breeders’ requirements, what I’m looking for is probably not what you might expect. I do NOT demand that you have a fenced yard or be a ‘stay-at-home’ mom , or, ‘doggy parent’, nor that you agree to take the pup to ‘doggy-day-care’, never leave it alone, take it to the vet every 6 mths for ‘wellness checks’ or the ‘doggy-shrink’. Nor that you use all the new age training methods. I do not have a 10 page contract written by a lawyer, nor do I insist that I must co-own every pup I sell. I am not adverse to placing a puppy with first time owners and have done so many times since 1967, with the first litter. To develop a great working partner, whether you are working livestock, doing agility, obedience or just a responsive, well adjusted, well mannered companion as part of the family, should be the goal. Yes, they are an active dog and love to participate in activities, but they should easily be able to settle down and lay around the house. There are extremely laid back, easy going dogs thru out the breed as well as really hyper active ones HOWEVER, neither extreme is the norm. Over the past 50 years, in attempting to breed a more Suburbs friendly dog, many breeders have selected towards a non-reactive dog. Unfortunately in some cases, this has resulted in the loss or minimazing oF many of the outstanding mental qualities of the breed. One problem I see today is that so many people have done their ‘homework.’ Either they have not done enough or too much. They have listened to and read so many varying and contradictory opinions and ideas, that they are either terrified of doing something wrong or they are afraid to correct the pup/dog, thinking it won't love them or they use a method that actually encourages the bad behavior (doggie-psycho-babble) , or are completely ineffectual, causing the problem to escalate by picking at the pup/dog constantly, instead of correcting him, and getting on with it. Puppies/dogs don’t have a concept of ‘bad behavior”. They don’t know that chewing up your new boots is ‘bad’. Or getting in the garbage, or ripping up rolls of paper towels, etc. They do this because they are dogs and its fun ! “Bad” is a human concept. They don’t do these things because they don’t love you. They are not messing on the floor when they are left alone, just to spite you. I know it’s not PC but being PC ie new age- has gotten more dogs of all breeds, put to sleep for temperament alone, than any other problem. When 99 out of a 100 times it is simply a matter of novice people not knowing when or how to correct unwanted behavior. Where you live should not be the biggest consideration, all things considered. It does not matter if you live in a condo, an apartment, the suburbs or a ranch. Or are hauling 10,000 miles a yr on the Rodeo or horse show circuit living out of your pickup. In any situation, care for the safety of the pup/dog must be taken into consideration as well as adequate exercise and supervision. But puppies are puppies and one must remember that they are going to bark and cry if left alone all day, so allowances must be made. What most Aussies want, is to be with their person/family. As they become older, and have been introduced to the concept of discipline and control in small does, the boss can be more insistent about howling and pitching a hissy fit when crated. I don’t expect everyone to be ‘the Dog Whisperer” in their understanding of dogs, and I don’t need this kind of owner for every puppy, but the ability to pick up some understanding of dog behavior and be willing to put forth the effort to guide the pup at appropriate times, is what’s necessary for a successful, rewarding relationship .Not only do assertive, confident puppies need a leader, but the softer, gentler pups do too. No matter the pup’s nature, be assured that if someone is not leading; it’s the nature of canines to fill that spot. Even if your entire household, humans and animals alike, are all a pack of cream puffs, the humans must be the mentally strongest cream PUFFS. What I’m looking for is an owner that is going to be the ‘leader of the pack”. Someone that is not only planning for the dog to be with them for the rest of its lifetime but that understands what the concept of the leader role is and how essential it is to the mental well being of the pup. I’m looking for people that love and appreciate dogs for being dogs and realize that they are not little people in furry suits aka ‘furkids’. There is nothing wrong with spoiling the puppy with toys and treats, and attention. Actually these are ideal training times and are perfect to begin to set down rules and limits. “Spoiling’ only becomes a problem when there are no limits on behavior. I operate under the assumption that people who buy puppies from me are going to be responsible for the safety and the proper upbringing of said puppy and will provide for its needs. I am always here for people that might need advice, and under the right circumstances will take a dog back. However I am not sympathetic towards the buyer, with a problem which they discuss with every owner or breeder of 2 litters with 5 yrs experience, on every Aussie list there is, and have tried every harebrained new-age training method, that there is, before contacting me. By that time, the puppy is usually ruined for anyone but an experienced dog person and there are not many of those around that want a companion quality, neutered dog, with a problem to overcome. 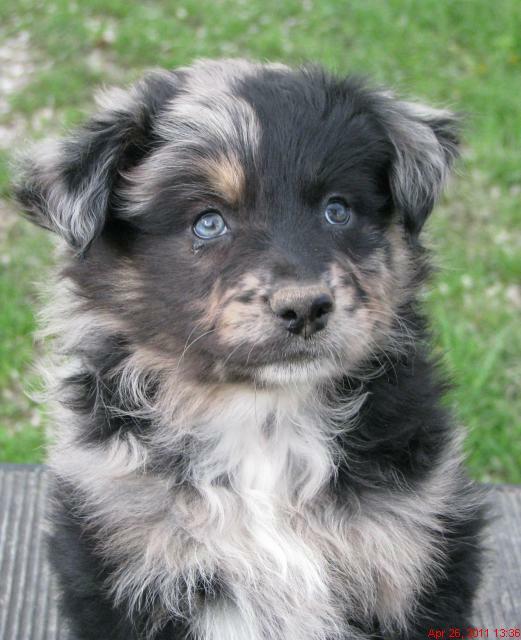 I realize that I have been repetitive but in doing so, I hope to emphasis what is necessary for one to successfully own a old style member of this breed and thus prevent those not wanting this kind of commitment, from purchasing a pup. Beginning in 1966 after getting my first Aussie, it didn’t take long before I was caught up in the excitement of this new breed. That lead to another pup, then another and to the idea of actually raising Aussies. Showing came later since at that time, ASCA show programs were non-existant.there were not any shows. It took about 10 years to acquire what I believed were superior individuals. When I did, starting in 1975 I began to develop the Fairoaks line. 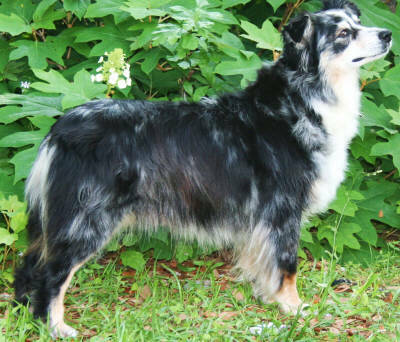 My goal was to consistently produce Aussies that are tops in all the categories; Over the years it became obvious the breed was changing and I didnt like most of the changes so the conscientious decision was made to continue to concentrate on the qualities that made up the old style working Aussie, with the breeding behind them, to consistently reproduce those qualities without adding or perpetuating any serious hereditary defects. Fairoaks is a definite genetic bloodline, where I have selected, personally, for many generations, from dogs which I have produced, for the mental, physical, and genetic qualities that I admire. Puppies with breeding potential are available only to those who appreciate and understand the 50 plus years that have gone into this bloodline The Fairoaks bloodline has many genetic virtues and even pups/dogs that might not ‘show’ in the breed ring, can make a large contribution to breeding programs because they carry these virtues BUT do not carry the majority of the inherited defects. I am willing to share my knowledge with those that are serious about becoming students of the breed. If you are just looking for a dog to raise puppies with, please look someplace else. ​​​​​​​​​​​​​​​​​Observing the puppy’s development begins at birth and is on going. Even after all these years and having what is called a closed gene pool, there are a few traits that I can see at birth. Head shape, body proportions, such as leg length to body length, are a few. I never judge them by color or markings, (as long as they are a recognized color). Starting about 5-6 wks, I can get an idea of structure and temperament, but everything seems to come together between 7 and 8 ½ wks. This age will show the balance and proportions the puppy will have as an adult. I can only say this about my own dogs since I have developed them, selecting the individuals with the traits I wanted and building the pedigrees behind the dogs we now use, what traits the pups will likely mature to possess. This age will also be a very good indicator of the temperament and personality of the puppy. I obviously try to match puppies to people. The strongest, boldest puppy in the litter should not go to a retired couple looking for a dog to go for walks in the woods. In the long run, what the puppy becomes is up to the owner. These puppies have great intelligence and trainability as they descend from generations of the same kinds of dogs that our ancestors depended on and I have worked diligently to see that they stay that way. I have successfully placed pups in all mainland states as companions and working dogs, as well as show/breeding and performance dogs of every sort. I am very proud of the fact that we have so many repeat companion buyers that come back after their wonderful friend has passed away. Starting in 1992 European breeders have taken a strong interest in Fairoaks breeding and I have sent good dogs to many countries, where they have made a strong contribution to the gene pool. Although I breed for MY perfect temperament, there are some variables between the litters and in the pups within the litters. Most are outgoing and friendly, a few, more standoffish and aloof. The vast majority will become protective, to some degree. Most are accurately discriminating. If a situation should become serious, nearly all will back up their protective behavior. I believe that this is particularly true regarding old fashioned Aussies which have not been bred towards a generic, soft kind of temperament. Do not think that the traditional Aussie is more likely to bite and is not friendly as that is NOT the case. They simply have the discrimination and intuition to react to a real or highly suspicious, real or perceived threat. It is up to the owner to provide safe confinement and security, whether that’s a fenced yard or pen or a crate in a private area of the house, or total verbal control. A fenced area for exercise is an excellent idea, particularly if you live in an urban or suburban area. Protectiveness is a quality that most Aussies will exhibit. This runs from just barking to actually biting if really provoked or seriously challenged by someone perceived as a threat. When out in public or properly introduced to strangers, Aussies should be accepting of them. However, remember that this is not a golden retriever! Dogs bred closer to the old tradition don’t understand complete strangers, wanting to grab them around the neck and get all licky-kissy ! How would you react if some complete stranger grabbed you on the street and started hugging and kissing on you ??? You wouldn’t like it either. ! Its up to you to protect your pup/dog from both people and other dogs that have no sense of Aussie decorum ! .The first 12 mths is the most important. The guidance, training and corrections the puppy receives during this time period will shape his entire life. The first 12 mths is also the time period that so many people ignore, or let slide, missing all the opportunities for training, because the puppy is young. This is the period that so many people look back on and realize how many little signs they either ignored or didn’t want to bother with, that set the stage for the issue that became an issue. With the mentality today of many people, the question “Can I make him happy ?” or “will he be happy without sheep or cattle”, is sometimes asked. People that have the concept that they are suppose to make their dog happy, are people looking for trouble without even knowing it. Aussies want to be with you. Having a leader that they respect, is what makes them “happy” and content, although I’m not sure that ‘happy’ gives the right impression. Many Aussies love to catch a Frisbee, or run agility, or are intense to work livestock, but not doing these things is not going to make them unhappy. If you are fawning all over the puppy/dog, trying to make it ‘happy’ you are setting yourself up for heart break. Dogs understand pack order. Hate to announce that I am no longer breeding.